NORTON, MA. – September 16, 2015 – Measurement Computing Corporation (MCC) today announced the release of DAQami version 2.0. 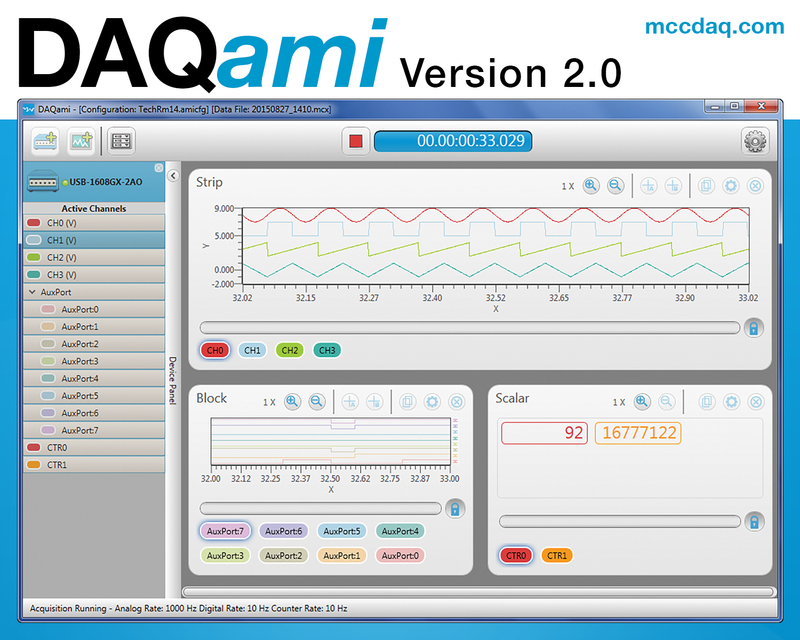 DAQami is an easy-to-use data logging software application compatible with most DAQ devices from MCC. DAQami allows users to display and log data, review data, and export data to programs like Microsoft® Excel or MATLAB®. Users can quickly configure acquisition and channel options and choose from a variety of data displays. New features in version 2.0 include support for digital and counter inputs, the ability to review acquired data during an acquisition, and support for additional MCC DAQ devices. DAQami is available for only $49 when purchased with MCC DAQ hardware and is supported under Microsoft® Windows 10/8/7/Vista® operating systems. Measurement Computing designs and manufactures data acquisition devices that are easy to use, easy to integrate, and easy to support. Included software options are extensive and provided for both programmers and non-programmers. We offer high-quality, reliable products, backed by one-year limited warranties and a harsh environment program.